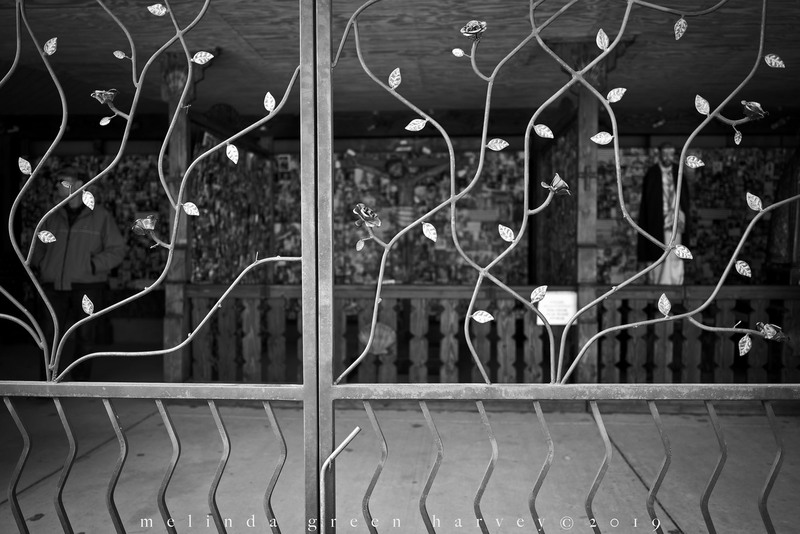 A leaf-embellished metal grate guards some statues, photos of people for whom prayers have been requested, and one man. Posted on April 9, 2019, in Photography and tagged 365 photo project, black and white photography, chimayo, church, learning to see, Leica, melinda green harvey, monochrome, new mexico, one day one image, photo a day, photography, postaday, road trip, sacred location, Saints, thoughtful seeing, travel photography. Bookmark the permalink. 2 Comments. Really nice gate ! Good image too . Thanks, Richard. I’ve tried shooting this gate on prior visits, but never got anything I liked.